The Minister gave this challenge while receiving a delegation from the Change Vision Nigeria Group led by Architect Tunde Imolehin that visited him in his office at Area 11, Garki I District, Abuja. Malam Bello reiterated that the protection of environment is a duty that must be carried out by all and sundry by making it more amiable for human habitation because it is our collective heritage. He emphasized that in Abuja, “we have the advantage of having a city that has been planned from the scratch, a city that really if we put our heads to it, we should be able to make Abuja just like any other city in the world. We have the resources, the weather is pretty good, and rainfall pattern here is quite good. So, there is no reason why we cannot make this city green and beautiful”. 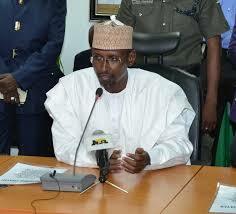 The Minister affirmed that the FCT Administration would continue to support any initiative that can protect the environment; adding “I will like to discuss more on the change garden concept because I think we have a lot of gardens here at locations in the Federal Capital City itself that we will like to serve as a model of what a real garden should truly be”. Malam Bello assured that the FCT Administration would partner very closely with Change Vision Nigeria Group to further develop the Parks and Gardens within the Federal Capital City; and unalloyed support in the forthcoming Abuja Business Forum. Speaking earlier, the leader of the delegation, Architect Tunde Imolehin revealed that the Change Vision Nigeria Group was established in 1996 with the vision to make everyone a change agent in Nigeria. Architect Imolehin said that the Group is in FCT Minister’s office to intimidate him on the forthcoming Abuja Business Forum scheduled for 18th May 2017. He lauded the Minister’s style of leadership in addition to his humility and straightforwardness.